Heat oven to 375°F. Unroll dough on work surface; press into 12x8-inch rectangle. Cut into 24 squares; place on ungreased cookie sheets. Bake 8 to 10 minutes or until deep golden brown. Remove to cooling rack. Meanwhile, in small bowl, mix cheese, bacon, onions and mayonnaise. 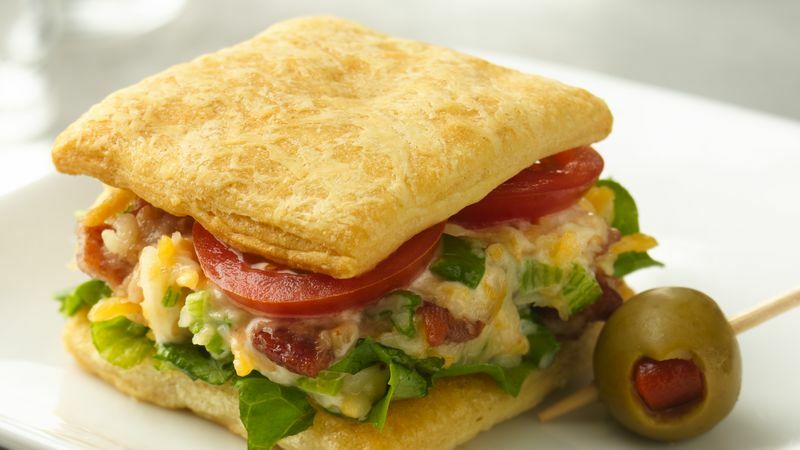 Place slightly less than 1 tablespoon lettuce on bottoms of 12 crescent squares. Top each with 1 heaping tablespoon bacon mixture and 2 slices tomato. Top with remaining crescent squares. Pillsbury® Crescent Recipe Creations™ is a flaky dough sheet with no seams, the perfect start for recipes, with the same great taste and texture as original crescents.